Directions 1. Preheat oven to 400* 2. Layer chiles on the bottom of a 8x8 square baking dish (or similar). 3. In a medium bowl whisk together 1/4 c. flour and 1/2 c. milk until all lumps are gone. Add more milk if needed. Whisk in 4 eggs and 1/2 tsp. of salt. Pour egg mixture over chiles. 4. Bake for 5 minutes or until eggs begin to set around the edges. While baking mix the Jiffy cornbread as directed on the box. (You can use the same bowl - I won't tell.) 5. Remove from oven, top with shredded cheese and then gently pour corn bread batter over top. 6. 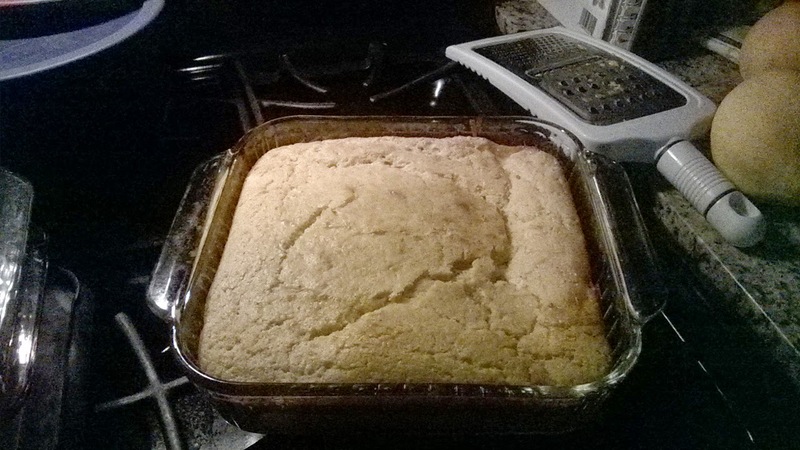 Continue baking for 15-20 minutes or until cornbread has set all the way through the middle. I cut it pretty close this week because I made a fatal mistake in grocery shopping. I brought the WHOLE family! I can shop pretty well with just my two boys since I have deal with my five-year-old that he gets $1 to spend when we go to the store. He knows if he asks for other things that are not on my list, then the answer will be no. He does a great job of not asking for treats and junk food beyond what his one dollar will buy. His dad is a different story. We were all out and about this Saturday morning and I figured we would just knock out shopping and go together as a whole family. My shopping list below is evidence of what happens when my husband tags along. Bold print items were not on my list:) I guess I can be relieved that we went to ALDI and not a store that would have cost more for all those little extras. I recently purchased the rug that was the "Red Hot" Special a few weeks ago week for $4.99 to replace our front door rug that was looking a little ratty. There were three color choices, that I saw, and I chose a gray and off-white diamond pattern. A few of the rugs looked a little frayed along the seams already like the construction isn't all that great? I picked one that appeared to be in good shape and so far it is holding up great! It is not rubber backed, so I will probably need to put a piece of non-skid material underneath it, but no biggie. The rugs I last purchase for my kitchen from Target were similar and I paid over $20 per rug, so these are a steal of a deal if they hold up for even a bit. **After washing once, there are some frayed spots, but I am still not disappointed for $4.99. Thanks to Carolyn for this quick dinner idea! Directions 1. 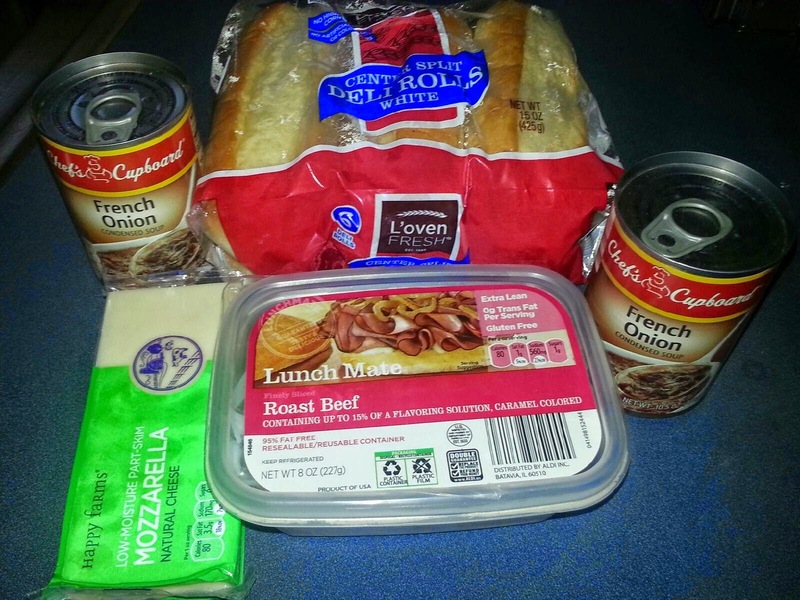 Simmer roast beef in french onion soup (no water) in a medium sauce pan until warmed through. 2. Drain meat reserving soup for later. Place meat on bottom half of bun. 3. Place cheese on top of meat and broil both halves in oven until the bread is lightly toasted and the cheese is melted. 4. Serve with french onion soup in small cups for dipping.